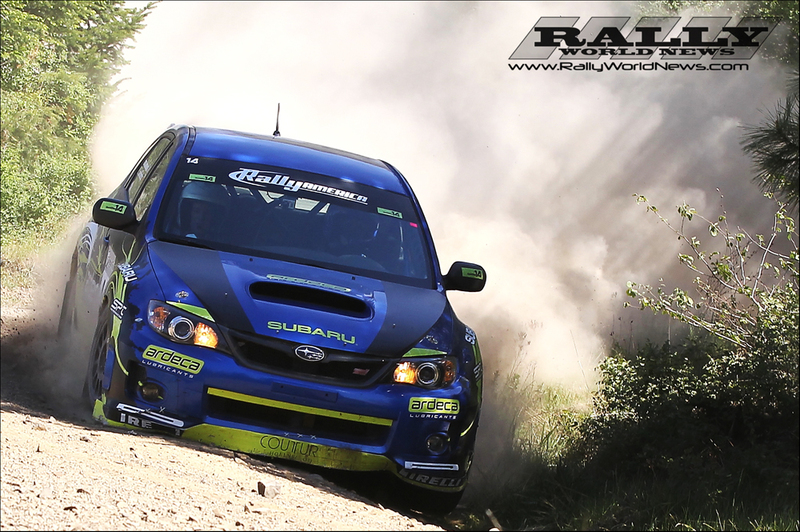 Portland, OR (May 6, 2013) – David Higgins and Craig Drew claim victory for Subaru Rally Team USA at The 2013 Oregon Trail Rally, while all hell unravels around them. 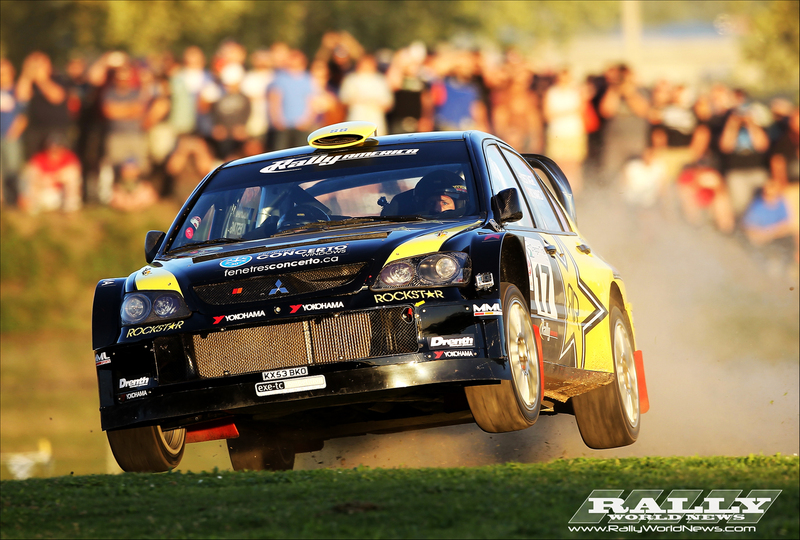 With the return of Ken Block to the 2013 Rally America Championship, and Antoine L’Estage debuting the mighty WRC Mitsubishi Lancer for the first time on America soil, the buildup to round three of the Rally America Champions was on a high we have not seen in American rally in a few years. Antoine L’Estage would draw first pick for road position, and would opt for third on the raod, Higgins would take the risky position of sweeping the loose gravel while Block would tuck into second on the road. As always the Oregon Trail Rally starts with a few short spectator stages over a mixed surface at Portland International Raceway, barring no issues the time gap between the top cars is usually marginal. For the entertainment of the rally fans on hand, the slower cars are set off first and the speed then builds to a frenzy with the top teams running last on the stage. With the cars fitted with mostly RallyCross style tires to handle the changing conditions, Higgins and Block would take stage wins on the first two stages, with Higgins edging out Block by just .08 of a second heading into stage 3. As the song goes “If it weren't for bad luck, I'd have no luck at all” Rallying is a lot about the driver, the car, but it’s also about a hell of a lot of luck, good and more often than not bad. As we mentioned in our past report, we were not expecting to see Antoine L’Estage breaking any records on the opening stages of the rally as it would take some stage miles to get acclimated to the WRC car, after two stages Antoine and co-driver Nathalie Richard were clearly off the pace already 16 seconds behind leader Higgins. As Antoine prepared to launch the mighty Mitsubishi off the line on SS3, the first of two stages run in the dark,the car went into road mode, this essentially killed all his lights and drastically reduced the power. Antoine would limp through the last two stages in the dark and nursing the car back to service. Without going into a lot of detail, let’s just say that Ken Block has had very little in the form of “good” luck at Oregon Trail Rally. SS3 the same stage where things went array for L’Estage, Block would also run into trouble losing his right front wheel. Running on only three wheels and the right front break rotor, Blocks Fiesta lit up the night sky as a stream of sparks trailed him around PIR. Somehow he completed the stage and went on to complete the last short test of the night. Running for the most part unopposed on the final two stages of day one, David Higgins built a gap of 38 seconds on L’Estage and 48 seconds on Block, as their service crews set to repair the damage. Onto day two, the rally would move to the Hood River area, the first true test of the rally, Gillhouley South, at only 4.8 miles in length this stage is a real eye opener for the drivers and crews as it twisted its way over the ridge and down the other side of the mountain. Block and L’Estage would take full advantage of Higgins as he swept the loose gravel off the surface, slowing his pace. Block claimed the stage victory over L’Estage with Higgins taking third. Feeling more and more confident behind the wheel of his first WRC car, L’Estage and co-driver Natalie Richard posted fastest times on the next two stages which included the notorious Fir Mountain stage, the longest stage of the rally at 15 miles. On the opening 3 stages of day two, more than 5 cars either rolled or were sidelined with mechanical issues. 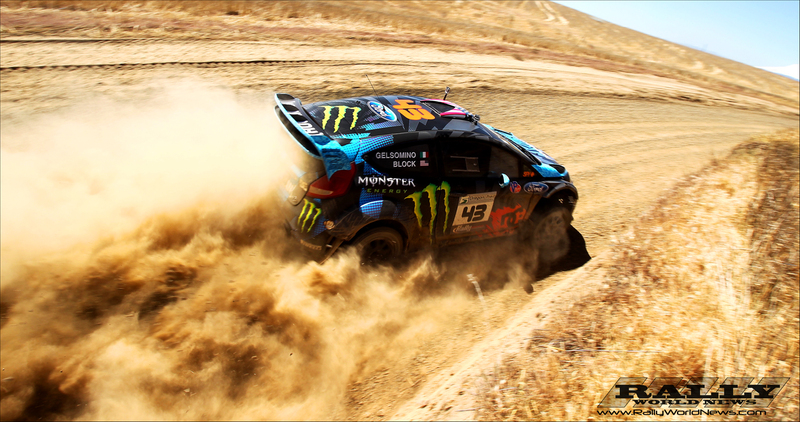 After a short service, the cars headed out to repeat the first three stages, Ken Block was on the attack over the second pass of Gillhouley South taking the stage victory. SS9 the second pass on “8000 UP” a new stage to the Oregon Trail rally, we would see the dramatic departure of Antoine L’Estage and Nathalie Richard as their Mitsubishi plunged off the road and down the hill side, eventually colliding and coming to rest against some trees. Both Antoine and Nathalie were able to walk away from their massive accident for the most part unharmed. The extent of the damage to the car is still under evaluation but it’s unlikely we will see the very popular Canadian and Rally American Champions at the next few Rally America rounds. Higgins would take the stage victory on SS9 as Block limped through with a puncture. Block would charge back on SS10 and 11 piling the pressure on Higgins with stage victories over these technical tests. Block's aggressive style often cutting deep in the corners netted him yet another puncture on SS12. Despite only winning 2 of the 8 stage victories up for grabs on day two, David Higgins and Craig Drew for the most part managed to have a clean run and therefore continued to build their lead on Block as he struggle with punctures and drive problems. David Sterckx and Karen Jankowski were having a great run netting them third overall while also leading the SP Class. While all the drama was unfolding off the front on day two, WRC Academy driver Brendan Reeves and sister co driver Rhianon Smyth were running riot over the 2WD class. 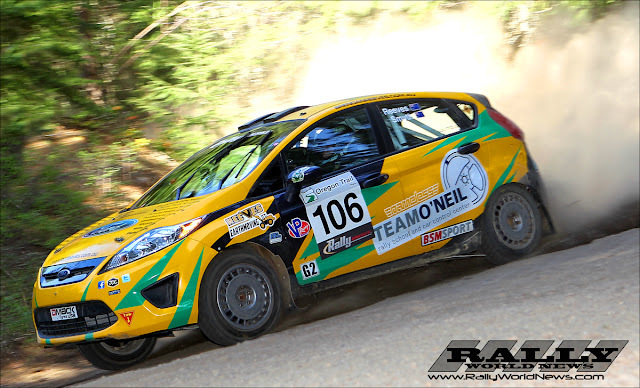 At the end of day two Reeves in the Team O’Neil Ford Fiesta R2 had a built a two minute advantage over Andrew Comrie-Picard in the Scion, with Dillion Van Way in another Fiesta rounding out the top three in 2WD. Day three would see the teams heading further west of Portland to the Dufur area for four of the five closing stages of the rally. We fully expected that Higgins would loss time to Block on the final day as he slowed his pace in hopes of a clean run to the podium. Despite a blistering run by Block on Day three, taking stage victories on all five stages, it barely made a dent in Higgins lead. David would check through the final control almost two minutes ahead of Block, Indonesian driver Rifat Sungkar on his Rally America debut edged out David Sterckx by the narrowest margin for the final spot on the overall podium. "I've got to thank Subaru for providing such a reliable, durable and fast car to Drew and I," said Higgins, "Once we amassed a big lead it afforded us the opportunity to really dial back the speed on Sunday and reduce the risks. We didn't win stages outright but knew it was the right strategy for victory. 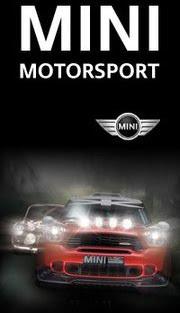 This is a very challenging event and I enjoy the big mix of character in the stages. There is still a long season ahead but we are in a really good spot now in the points." In the Super Production (SP) Class David Sterckx and Karen Jankowski reinserted themselves into class contention with an SP victory. The pair led the SP class from the start despite experiencing engine problems on day one. Sterckx has been showing improved pace on the opening rounds of the 2013 SP Championship, he would build a 4 minute lead over his fellow SP competitors to claim his second SP podium of the year. "The rally was a real pleasure because I am finally getting closer to the limit since last year was only my first year on gravel," said Sterckx, "Karen and I have a good communication and we are getting more comfortable with the notes. Tires were very important this weekend and our Pirelli tires were unbelievable. So many teams had multiple flats this weekend but we didn't have a single one, which was a big advantage for us. 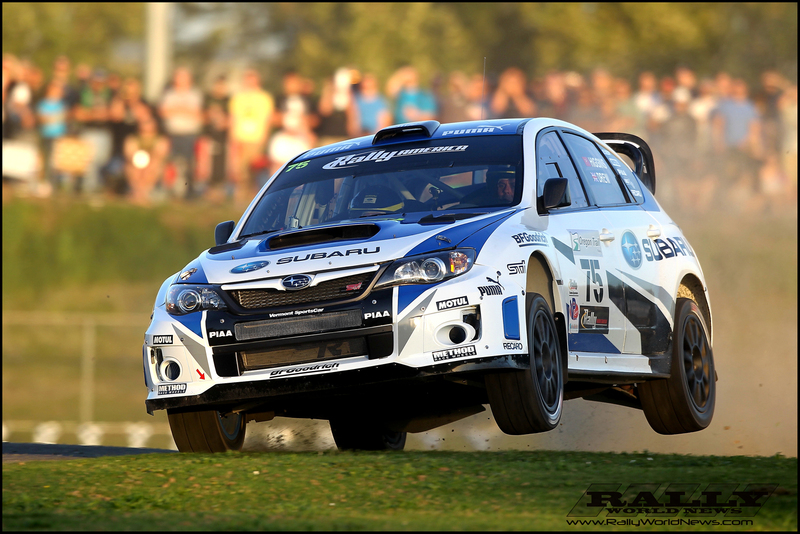 We had issues with our engine but the Subaru engines are so strong it held together all weekend." Hood River, OR local Dave Henderson with co-driver Terrence McDowell fought a furious battle of seconds with 2012 Super Production Class Champions, Lauchlin O'Sullivan and Scott Putnam for second place. Henderson overtook O'Sullivan on stage 15, and O'Sullivan suffered a massive rollover on stage 16. 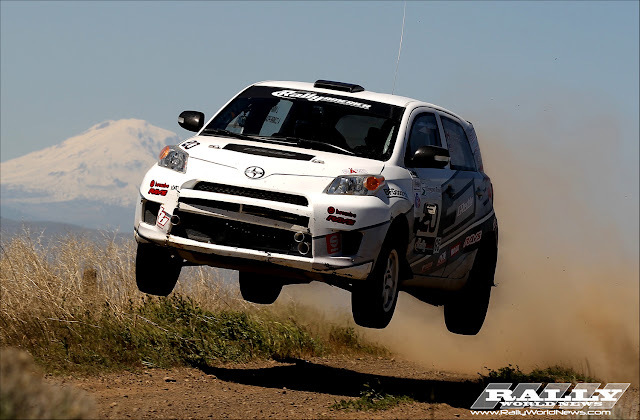 This is Henderson's second consecutive SP national podium at the Oregon Trail Rally. Henderson also won all three regional rally events - Wagons Ho!, Shunpiker Stages and the Trails End Regional Rally. Third place in Super Production was awarded to another Oregon driver, Mike Goodwin, with co-driver Michael Milos, after event officials discovered a timing error that moved current SP points leaders Evan Cline and Jake Blattner into fourth place. Coming off a few stellar years on the WRC Academy we had big expectations of Brendan Reeves and Rhianon Smyth on this their first rally in the United States. The pair teamed up with Team O’Neil/Ford Racing in an effort to reel in the Scion Racing Team driver Andrew Comrie-Picard who opened commanding points lead with victories on both of the opening rounds of the 2013 2WD championship. From the opening stage of the rally it was clear that Brendan was in a league of his own, not only was he devouring the 2wd class he was also matching times with a lot of the SP and Open class cars. Brendan and Rhianon took stage victories on 16 of the 17 stages in the rally, only giving up stage 14 to ACP in the Scion. "What an amazing feeling it is to come to America for the first time and win the class convincingly," Reeves said. "We had a trouble-free run thanks to Team O'Neil and the effort they put in. The Ford Fiesta R2 was brilliant even on today's blindingly fast stages, and Rhianon did a great job calling the notes." Fellow Ford Fiesta drivers Dillon Van Way and Andrew Edwards drove a relatively problem free race and held third place for much of the event until Comrie-Picard experienced overheating issues on the last stage. Comrie-Picard lost significant power and ceded second place to Van Way. The Scion team had to be towed into the final controls by three different teams to finish the event and take third place in class. Van Way and Edwards now have two second place finishes this year and Comrie-Picard's third place finish helps to keep his 2WD points lead in the standings. 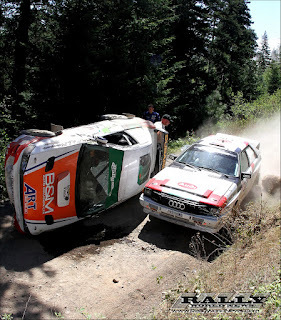 Notably, Edward McNelly and Ole Holter was not able to finish the Oregon Trail Rally when they went off-course on stage 5. The carnage in Oregon will for sure have an impact on the entry list heading into round four of the Championship, STPR in Wellsboro PA in just a few short weeks.